The chap are a flat round Thai cymbal with a rounded knob in the center. This cymbal has wider and thinner metal than the Ching . The center bulge is about 2cm in diameter and the flat outer rim extends a further 2.5 cm. Each cymbal has a cord fastened through a hole in the top of the knob, often with a tassel or fancy decoration on the end. The two halves are not fastened together as are the ching. There are two sizes at the present a small pair , chap lek and a larger size chap yai. 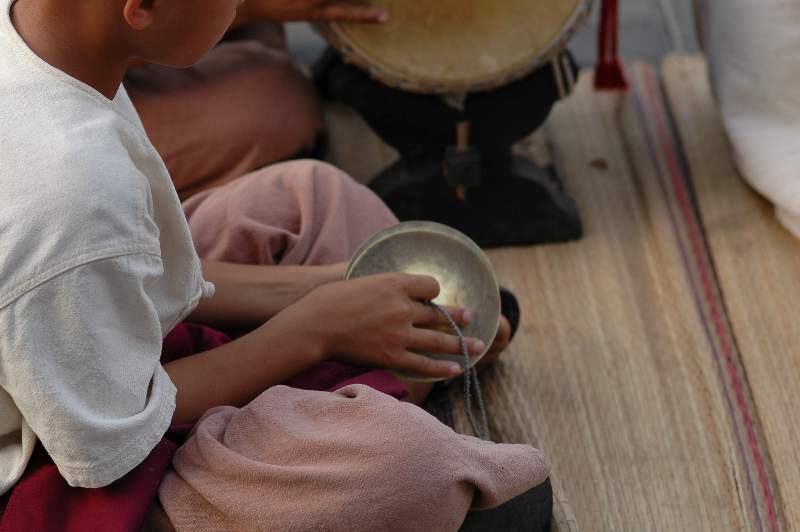 The function of the chap leck and yai is also to play rhythm. The name is typical of many thai names in that it actually mimics the sound of the instrument. If the cymbals are brought together sharply then the sound is like a "Chap" but if the cymbals are let to ring the sound is more like a "chaeng".